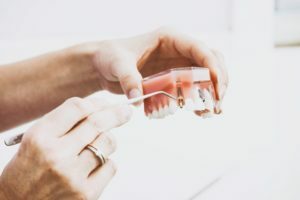 Your dentist just informed you that you’ll need a dental implant, but what does that really mean? Dental implants are an option for people who have lost a tooth since their main purpose is filling in for the missing tooth. They keep your mouth functioning properly by replacing the tooth in your bite and your smile. Dental implants are surgically implanted in the jaw, and in time become as strong and stable as any of your natural teeth. The dual appeal of sturdiness and aesthetic is possible through the application of a titanium base and an optional ceramic crown. The base of dental implants is the most important part. This is the part that is surgically placed into the jaw. The base of a dental implant is a titanium screw. Your dental specialist places it into your jaw, and you allow it to heal. In time, the bone of your jaw will fuse to the screw base, making it a permanent part of your body. The fusion of titanium and bone is an essential aspect of the dental implant. This is possible because titanium is biocompatible. Over time, your bone will fuse with the metal. This results in a permanent replacement tooth that’s actually stronger than the rest of your teeth. Though there are many options for the crown of the tooth, a titanium base is essential for proper functioning. The crown of the dental implant refers to the portion that extends above the gum line. While dental implants are titanium below the gum line, they could be made out of a variety of materials on the surface. Typically, however, it’s either made of pure titanium or a ceramic crown over the titanium. If your dental implant is in a location that’s difficult to see, you don’t need to put a ceramic crown over it. People don’t tend to see your molars when you speak, so there’s no harm in leaving the dental implant unadorned metal. It can be shaped into a tooth, allowing you to have a natural bite and easy chewing without any trouble. If your dental implant is further forward in your mouth, it’s possible to opt for a ceramic crown. This is a tooth-colored shaped cap that fits over the titanium core. Your dental specialist can shape and color the ceramic so it looks natural against the rest of your teeth. This is an amazing way to restore a smile that’s been blighted with a missing tooth. Replacing a missing tooth with a natural replacement restores the appearance of your teeth. You should exercise care when chewing on your ceramic crown, however. While your dental implant will fuse with your jaw, it is possible to chip or crack the ceramic implant. Proper care will help you keep your smile intact for years. Dental implants are a great way to restore the function and appearance of your mouth. A dental implant will bond with your jawbone, becoming a permanent fixture of your smile. You can choose to leave the top as plain titanium. However, if you want a more natural look, your dental specialist can give you a ceramic crown. This tooth-colored crown will give you a natural grin instantly.